Is the Universe heading for a Big Crunch? The only place in the universe to get enough energy and matter for the Big Bang is the Big Crunch. So the universe must be cyclical? Re: Is the Universe heading for a Big Crunch? A cyclic universe was considered a real possibility by cosmologists - until the discovery of the accelerating expansion of the universe in the 1990s. I see your logic, and can agree with you that our apparently expanding big bang "arena" quite possibly was initiated by the collapse/bang of a preceding big crunch. I appreciated that you put a question mark at the end of that statement, because it seems at least as likely that our big crunch was not the result of gravitationally caused contraction of the galactic structure in an earlier cycle, but might instead be the result of the swirling rendezvous (convergence) of two or more separate expanding big bang arenas across a larger (why not potentially infinite) big bang arena landscape of the greater universe. No one knows for sure what the fate of the universe will be. However, there are some informed ideas as to what form it may take. One aspect of this is heat death. Another is the concept of a big rip. Where not even particles as we know them will exist. We do not have enough data to tell which ideas are correct. That is why collider experiments are investigating the conditions around the time of the big bang. The results will give new insights and confirm or reject some theories about the start of our universe. This may also shed light on its future. Weird stuff Kryptid, especially considering a infinite universe, homogeneous and isotropic, with no 'singular entry point' for a Big Bang. What exactly do they think oscillate? No one knows for sure what the fate of the universe will be. However, there are some informed ideas as to what form it may take. One aspect of this is heat death. Another is the concept of a big rip. Thing is if you belief in Eternalism and Finitism then time has an end. Where would all the energy and matter go at the end of time? Back to the start of time? The expansion rate is what is oscillating, as best as I can tell. Speeding up, then slowing down, then speeding up again and so on. So not this steaming pot of virtuality presumed to occupy 'space'? If I got it right they used stars to define it from? Uh... sorry, you lost me. 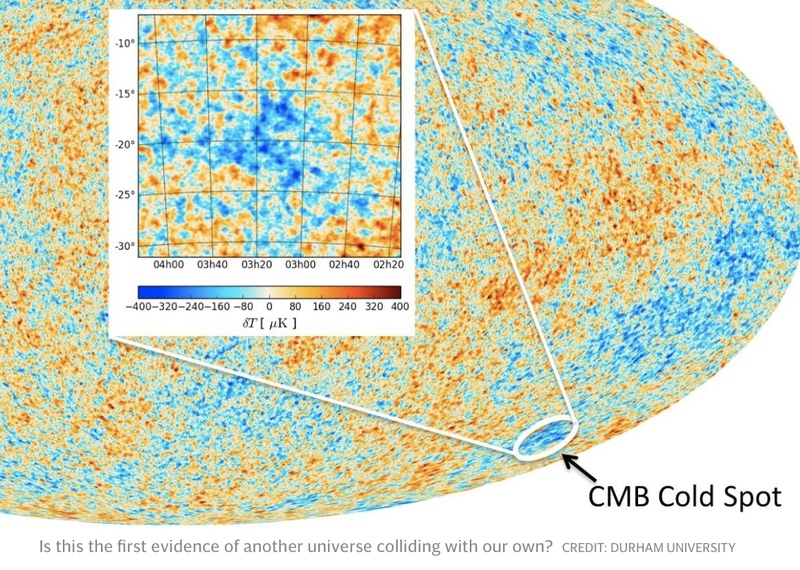 The diagram you presented is the Cosmic Background Radiation map. If you look at the scale, you can see that these "much" colder patches are 0.0004°C cooler than the surrounding areas. Very true. You point out the precision of the WMAP and Planck measurements, being at such tiny variances, lol. The tiny temperature difference in that particular region of space makes it an anomaly, relative to the surrounding background temperature and the overall average background temperature. I don't know Kryptid, I like the assumptions, they make sense and if I now remember right it was a woman pointing it out. One of the most important discoveries ever made. But using points of definition isn't a answer to the thing(s) I wonder about. Are they presuming a 'fabric of space' to define it? Think about it. If there is no point of a Big bang, what is your definition of a distance? You can also look at it this way. If there is no singular point we can define to the Big Bang, and there shouldn't be as long as all viewing spots, no matter where or at what time, show us the same view relative density distributions and age (aka a homogeneous and isotropic universe) then a single singularity creating the universe becomes very questionable. If you to it add a accelerating expansion then the question also becomes one of what 'age' one now would like to define those new patches. Assume that there is no 'end' to what we call the Big Bang and that what we see 'expanding' also have the same origin, although of different properties. Space doesn't have a 'speed limit', which differs it from 'c', as defined over a whole patch. It doesn't state that it breaks 'c' though creating each 'new point', just that the distance we measure between two buoy's appear to grow faster than 'c' for us. what I meant by questioning 'distance' is just that I think there is a deeper question hiding looking at this universe. It's a unproblematic definition on the surface :) And of course, if it now 'shrunk' instead of 'expanding' I would presume the 'same' origin to be the cause. Still, if it shrunk it's a reversal, isn't it? And such I would connect to the arrow of time, which presuming that we have a one way arrow shouldn't be able to happen. What ' If there is no singular point we can define to the Big Bang, and there shouldn't be as long as all viewing spots, no matter where or at what time, show us the same view relative density distributions and age (aka a homogeneous and isotropic universe) ' states is this. It doesn't matter where you are or at what time. Everything will look the same and the 'Big Bang' is at the farthest reaches of that 'early light' you observe. Wherever you are, you're at the 'center' of the universe. So, there are 'centers' of it, everywhere. Which, when turned around also state the the 'Big Bang' started, everywhere. No single origin.